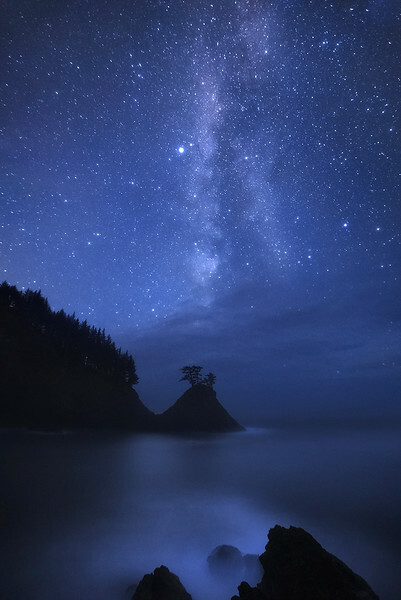 This year (2015) partially due to avoiding the unusually hot weather in the Pacific Northwest as well as too much forest fire smoke, I had the great privilege of spending about 2 straight months on the Pacific Coastline from the top of the Olympic Coastline down through the sublime Oregon Coast and the Northern California Coast. Here on 2 separate attempts, I scrambled and climbed down a cliffy area about 500 feet to the beach and at the lowest tide got out on a sea-stack rock to get stranded all night. I played guitar and took 15 minute naps amid the roaring waves all around. One of the funnest times I have had taking a photo.